A surge of smaller and lower-priced media tablets has led International Data Corporation (IDC) to increase its 2013 forecast for the worldwide tablet market to 190.9 million -- that's up from its previous forecast of 172.4 million units. Increases in tablet shipments have been made throughout the forecast period with an average increase of 11 percent between 2013 and 2016. The latest IDC forecast estimates tablet shipments to be upwards of 350 million by the end of 2017. "One in every two tablets shipped this quarter was below 8 inches in screen size. And in terms of shipments, we expect smaller tablets to continue growing in 2013 and beyond," said Jitesh Ubrani, research analyst at IDC. Vendors are moving quickly to compete in this space as consumers realize that these small tablets are often more ideal than larger devices for their daily media consumption needs. 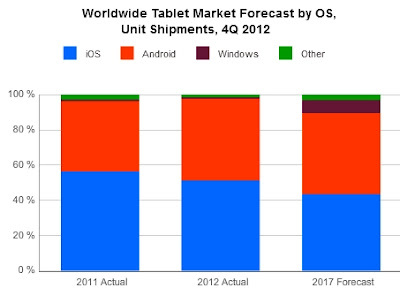 Once again, Google android-based tablets expanded their share of the market in 2012, and IDC expects that trend to continue in 2013. Android's share of the market is forecast to reach a peak of 48.8 percent in 2013 compared to 41.5 percent in IDC's previous forecast. Android's gains come at the expense of Apple's iOS, which is expected to slip from 51 percent of the market in 2012 to 46 percent in 2013. Longer term, both iOS and Android will eventually relinquish some market share to Windows-based tablets, with Windows 8 predicted to grow from 1 percent of the market in 2012 to 7.4 percent in 2017. However, IDC expects Windows RT growth to remain below 3 percent during the forecast period. "Microsoft's decision to push two different tablet operating systems, Windows 8 and Windows RT, has yielded poor results in the market so far," said Tom Mainelli, research director at IDC. Consumers aren't buying Windows RT's value proposition, according to IDC's assessment, and Microsoft and its partners would likely be better served by focusing their attention on improving Windows 8. IDC believes that more focus might drive better share growth in the tablet category down the road. While IDC continues to revise its tablet forecast upward, they have done the opposite with the eReader forecast. The growth of low-cost tablets is clearly damaging the prospects of the single-use eReader, and IDC reduced its forecast for the category by an average of 14 percent between 2013 and 2016. IDC believes eReader shipments peaked in 2011 at 26.4 million units. After declining to 18.2 million units in 2012, the category is expected to grow only modestly in 2013 and 2014, before it begins a gradual and permanent decline beginning in 2015.